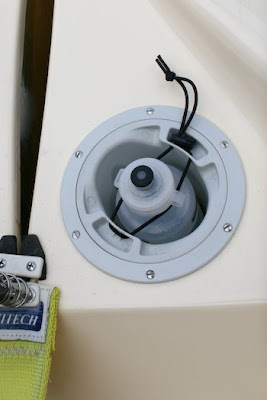 Greg Little, the author of today's Bucket List post, is the inventor of the Bottleport a "patent pending hydration solution for small sailboats and other watercraft." It's one of those devices that is so well suited for its purpose that once you've seen it you wonder why nobody has ever thought of it before. 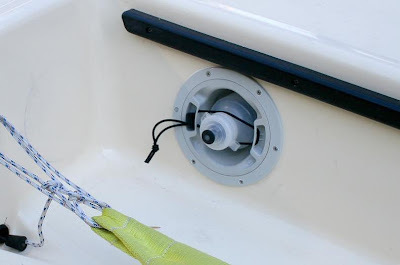 Essentially it is a bottle holder that screws into one of the standard 5" inspection ports often fitted to small sailboats. 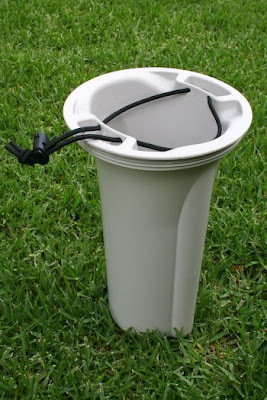 It has the same watertight seal as the original lid for the port and provides a way to hold a drink container that is totally secure, and easily accessible with one hand. Having experimented for 25 years with various other homemade solutions for carrying a water bottle on a Laser I was immediately attracted to the elegance of this solution. Greg sent me a prototype, and my son and I tested it out on our sails on the last couple of weekends. What can I say? It works exactly as advertised. No problems whatsoever. Check out the Bottleport website which has more photos, videos, FAQ, everything you would want to know. The Bottleport goes on sale tomorrow, October 20. It's the perfect present for the Laser sailor in your life. Update: An alternative way to mount the Bottleport on a Laser, in the cockpit sidewall. Regarding the aft location, I read your comments and was thinking the same thing. I put two 5" ports aft of my cockpit to do some repair work. However, I am concerned that the bottleport will be too long. Any idea of its length? I asked Greg that same question and he assures me that it will fit in a port on the rear deck. My only issue then will be to choose a water bottle that doesn't have a mouthpiece so high that it might foul the tiller. I just measured the BP and it's 9" long. That is so brilliant and so simple! I'm blown away by that!!! Hey Pete, yes the Bottleport will work in the back deck as there is more than enough clearance. Look carefully though to make sure you're not cutting into any reinformeent plates or stringers or stuff like that. I just installed this one in my boat but haven't had a chance to try it on the water yet. Rats. No image. Anyway, I have it installed in the side cockpit wall toward the back. There's very little chance of it fouling on anything and it looks pretty slick. This is Greg Little by the way. I've added at the bottom of the original post, Greg's photo of the Bottleport mounted in the cockpit side wall. Any plans to produce a 6" bottle port? I'm a Hobie 18 sailor and the hull port are standard 6". I store my drinks in a port bag, but this would be ideal during ragattas. Hobie 18 sailors would buy these up.